Discover three social selling tactics you’re better off avoiding this year, unless of course you want to spook your prospects. Some people think of Halloween as a holiday for kids, but this $7 billion industry is clearly cause for celebration among people of all ages. While it used to be that you could wear an old sheet over your head and hit that costume party, today’s revelers go all out, often spending $100 or more for a costume. It’s not enough to just show up nowadays – it’s about making a lasting impression. Just as Halloween merrymakers have stepped up their game, sales professionals need to change how they compete in a difficult selling environment. Gone are the days of simply showing up at a business’s door and delivering a canned pitch. Instead, it’s become critical to differentiate yourself from the crowd in new ways that account for changing buying habits. Social selling represents a more successful model. Who wants to be a ghost, after all, without a presence in the contemporary marketplace? The cold call has always been a hit-and-miss, low-ROI activity – it just happened to be the only tactic many sales people knew. Taking this approach in today’s B2B environment truly gives buyers the shivers, casting you in a bad light as meddlesome and unworthy of spend. An out-of-the-blue call to any random business listing can effectively end any opportunity to convert prospects into customers. A smarter way to approach sales prospecting is to focus on the right people and companies – those who can actually benefit from your product or service and who have the authority to purchase it for the organization. Lead Builder serves as a powerful and easy-to-use tool for finding prospects, creating targeted leads, and refining searches to test campaigns. We all have email fatigue, and the condition is epidemic among prospects. Virtually every marketplace is saturated with suppliers sending messages en masse and calling it a marketing plan or sales strategy. We all know the results of this frightening practice – awful open rates, unread messages in spam folders, and wasted opportunity. According to the Harvard Business Review, 90% of decision makers never respond to cold outreach. In our hyper-fast world where everyone with an email account is barraged by mis-timed, mis-targeted blanket pitches on an everyday basis, it’s necessary to be smarter. For instance, a well-crafted InMail developed with prospects’ needs foremost in mind can be the difference between open and delete. Insights can help sales professionals plan and create messaging that converts prospects to customers. There’s always that one person at the Halloween party who, for whatever reason, goes it alone. Maybe it’s intense shyness, undeveloped social skills, or that ultra-real sea lion costume incorporating real anchovies, but the fact remains none of the other guests wants to be near this mammal out of water. Similarly, prospects don’t want to trust their money to an unproven commodity that has not demonstrated an understanding of them or their business. If you want to be the life of the party among prospects, you need to show that you’re part of the in-the-know crowd. Building relationships and establishing authority online have become critical functions of selling, and to doing this effectively involves growing and leveraging your network. Monitoring industry movers and shakers, sharing expertise in your knowledge areas, and asking for others’ perspectives can allow you to activate an engaged network that builds trust with prospects. Whatever your industry or product, social selling needs be an integral part of your sales strategy. The numbers bear this reality out. For instance, sales professionals using social networks for sales experience a 16 percent increase in year-over-year revenue, which is four times higher than revenue increases at typical companies. This isn’t your first party, after all. You have the substance, wit, and moxie to focus on the right people, stay informed with insights, and build trust-filled relationships. The specialized resources within LinkedIn Sales Navigator can help. 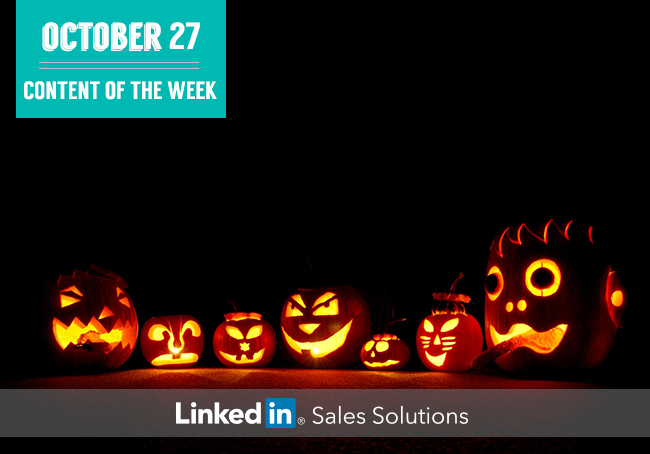 You don’t need to knock on doors to get scary-good social selling advice. Check out our latest webinar, How Leading Sales Pros Use LinkedIn for Selling.